We love Pumpkin in this house! I am not kidding, we really do love pumpkin. We have had pumpkin pancakes three times in the past month and there is no sign of slowing down. Noble loves them just as much as Zack and I. Zack is already requesting a pumpkin pie which I am trying to hold out on making until Thanksgiving, but not sure if I will make it. 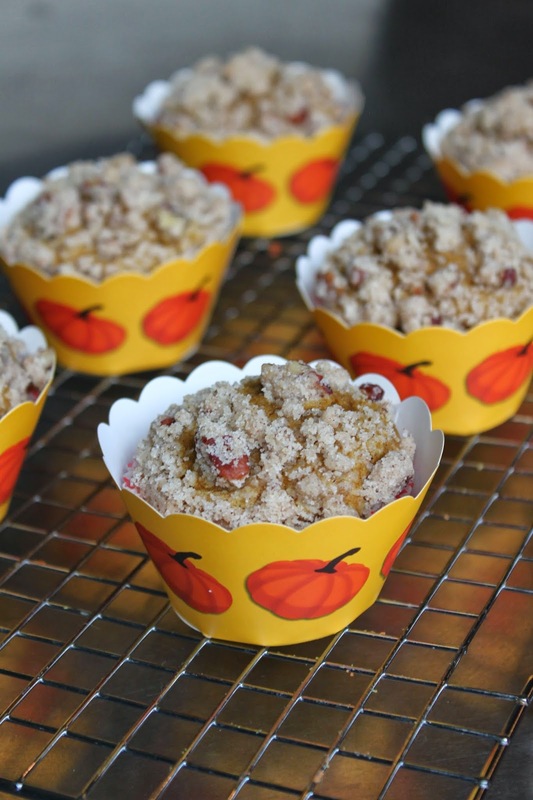 I have made pumpkin muffins a couple times before on Baked Perfection, and every recipe I have made so far has been fantastic. I honestly don't have a favorite. I decided to try a new recipe, because why not. I did not put a cream cheese filling in these muffins because I did not have any cream cheese on hand and was not about to go out and get some. Perhaps the cream cheese would have made these even more delicious, but I thought they were great just as they were. 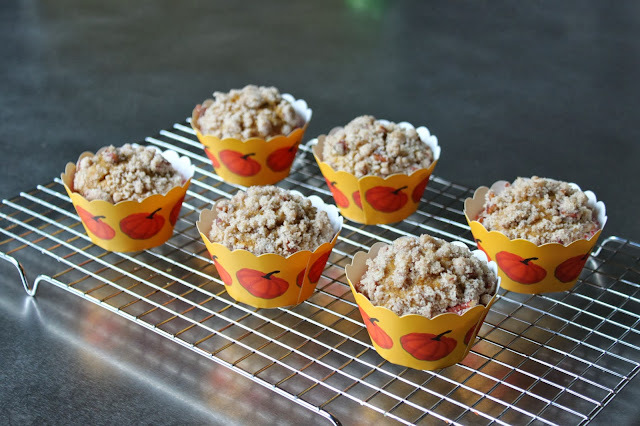 Preheat oven to 350 degrees F. Line a standard 12-cup muffin tin with paper liners; set aside. Make the Pecan Streusel: In a medium bowl, use a fork to combine the flour, sugar, pecans, butter, and cinnamon. Set aside. Whisk together the flour, pumpkin pie spice, cinnamon, nutmeg, cloves, baking soda, and salt in a large bowl. In a medium bowl, whisk together the sugar, pumpkin, eggs, oil, and vanilla. Pour the pumpkin mixture over the dry ingredients. Use a rubber spatula to gently combine the batter, mixing just until the dry ingredients are moistened. Divide the batter evenly among the prepared liners. Sprinkle the pecan streusel on top of each muffin. Press on the streusel lightly to make sure it adheres to the batter. Bake until golden, about 20 to 25 minutes. Cool in the pan for about 5 minutes, and then remove muffins to a cooling rack to cool completely. Store in an airtight container in the refrigerator. Are you ready for Halloween? I know we are at my house. We took Noble to a trick or treat event at a nice shopping center down the road this past Saturday and had a blast. We dressed him up as Dracula and he could not have been any cuter. Conveniently he also decided yesterday was going to be the day he started full on walking. He has been taking a few steps here and there for the past two months, but yesterday he just took off and has not stopped since. Needless to say, it made trick or treating with baby Dracula even more fun. We plan to go to a couple houses in our neighborhood with him on Thursday, but want to be home for the kids who come to our door. We are also going to a Halloween party at Noble's school this Thursday, it is going to be a busy Halloween week! For those of you who are looking to make a quick and easy Halloween treat, you should try these cupcakes. I used box cake mix because I needed something quick and easy myself. To jazz up the cupcakes I tinted a quarter of the bater orange and swirled it in (see photo at bottom of page). I also made homemade vanilla frosting and tinted it orange, green, and purple. 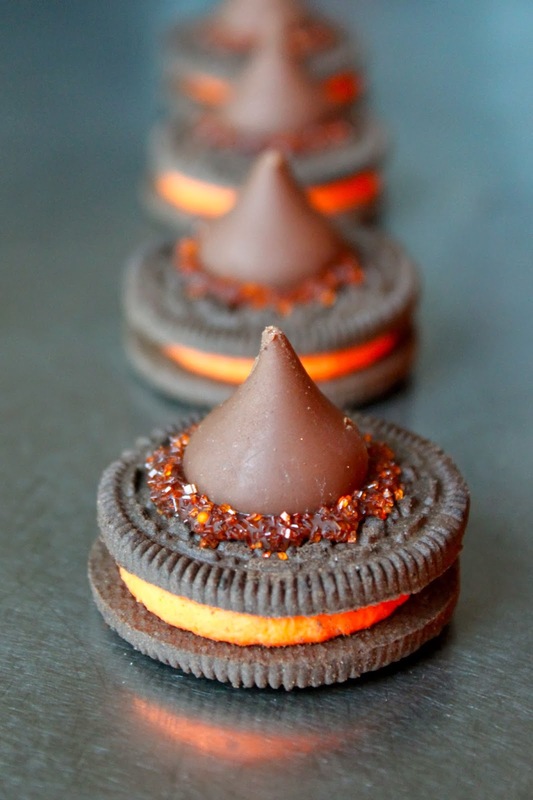 These were delicious and would be perfect for any parties this week! Place 24 cupcake lines in cupcake pan. In a large bowl, mix together the cake and pudding mix, sour cream, oil, eggs, and vanilla extract until well blended. Remove approximately 1/4 of the batter and place in smaller bowl. Add orange food coloring and stir in until well blended and you have reached your desired shade of orange. Evenly divide the non-dyed cake batter into the cupcake pan. 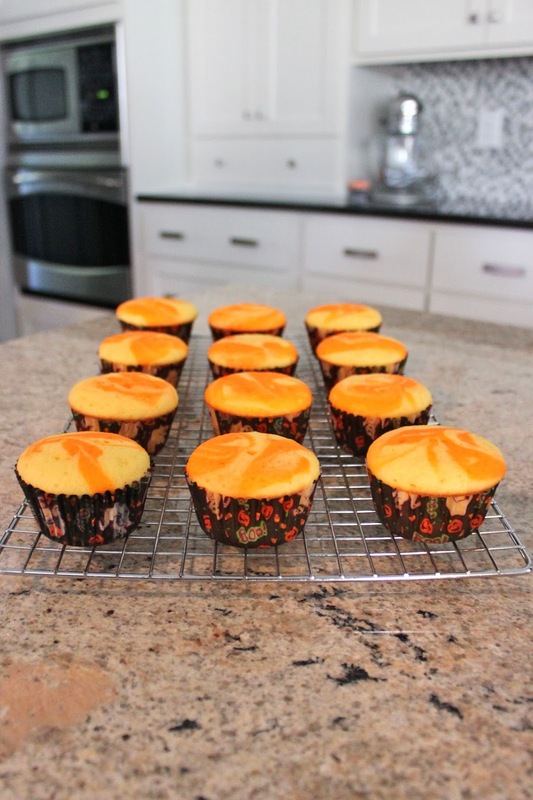 Drop spoonfuls of the orange batter into each of the cupcakes. Use a toothpick to swirl each cupcake. Beat butter and vanilla until creamy. Add salt. Add powdered sugar 1 cup at a time, beating until combined. Add milk 1 tablespoon at a time until you reach desired consistency. 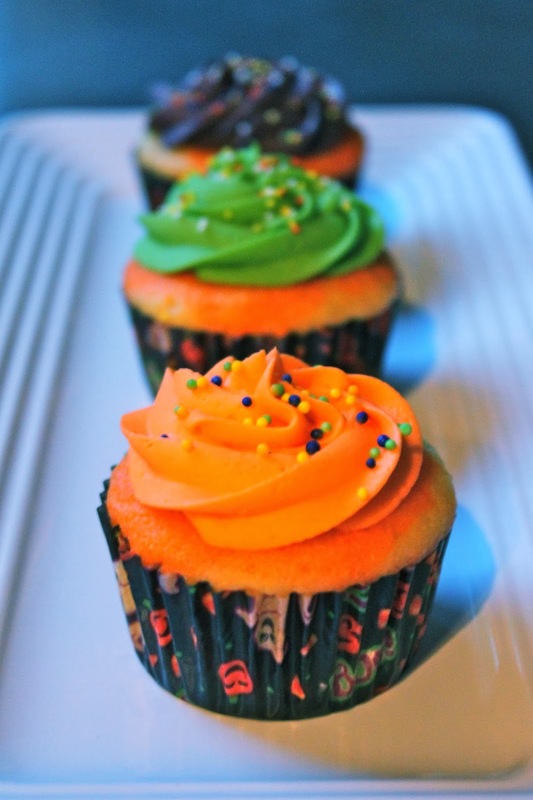 If desired, divide frosting into three bowls and add food coloring until you reach desired colors. I have not mentioned in a while how much we love chocolate chip cookies in our house. I don't make them nearly as often as I used and my waistline thanks me. The other week I decided that we were due for some chocolate chip cookies and since it is almost Halloween (one of my personal favorite holidays), I decided to spook them up a bit. I purchased some fun Chocolate and White Chocolate chips that are made by Nestle. The white chips are dyed orange and they are marketed specifically for Halloween which suited them perfectly for this cookie. 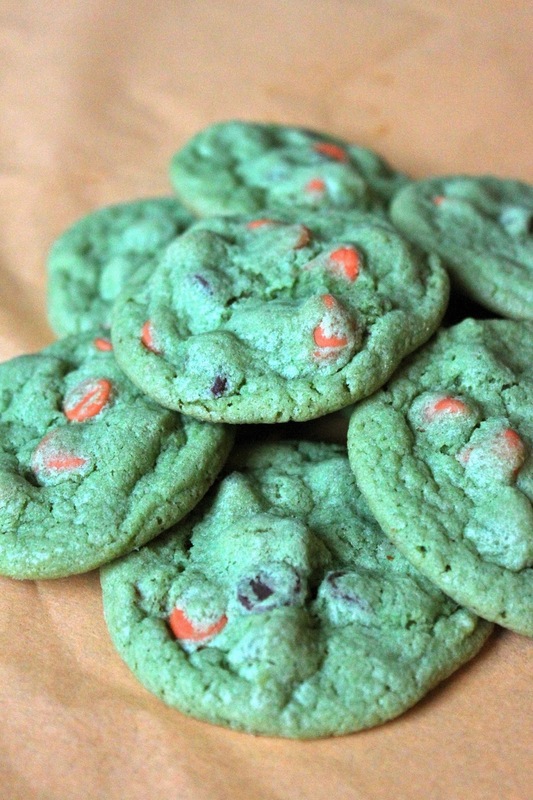 I added some green food coloring to the batter and made the perfectly spooky for Halloween. In a medium bowl combine the flour, baking soda, salt, package of vanilla pudding mix, and dash of cinnamon. In a second larger bowl beat together the butter, sugar, brown sugar and vanilla extract until creamy. Add the eggs one at a time, beating well after each addition. Slowly beat in the flour mixture until smooth. If adding food coloring, beat in until you reach desired color. Stir in the chocolate chips. Drop by rounded tablespoon onto ungreased cookie sheet. Bake 9 to 11 minutes or until golden brown. Cool on wire rack.